Probably as important a British choral release as we'll see this year. David Matthews's Vespers, in Latin and English, inspired by Monteverdi but taking in texts by Rilke, is his largest choral work, premiered at the 1995 Huddersfield Festival in honour of the centenary of Malcolm Sargent’s birth, and unheard again till this recording. Non-doctrinal yet celebrating the religious sense as such, this is a work both of great beauty and of genuine spiritual force. It encompasses as violent an orchestral scherzo as Matthews has ever written, choral writing of rare yet eminently traditional refulgence, beautifully flexible vocal solos (Katie Bray's vibrato a bit obtrusive at times), rising in 'Pulchra es' to a peak of ecstatic utterance. I was moved and rather awed by the mastery of large forces to such humane, celebratory goals. 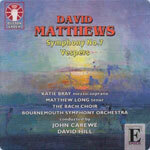 No mere makeweight, Matthews's recent Seventh Symphony (2009), unlike his epic Sixth, is a compact and hugely resonant single-movement structure. Commissioned to be played alongside Mahler’s Seventh, its antecedents are contrastingly Sibelian, growing from a great melodic paragraph that dominates much of the proceedings; and with its uncharacteristically decisive coda, the work has the (hopefully temporary) feel of a symphonic epilogue. In both the Symphony and the Vespers, it's the cumulative power of Matthews’s music that impresses, the ability to build huge purposeful paragraphs that actually go somewhere and deliver on arrival - a rare faculty these days. Blazingly committed performances do full justice to, yes, one of our greatest living composers.